Are you an FSP2 member? (*) indicates required fields I agree to the Terms & Conditions. 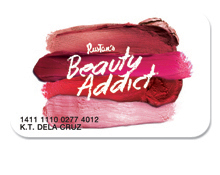 For every PHP 200.00 purchase at Cosmetics, Perfumery and Toiletries Division of Rustans Department Store, Beauty Addict member will earn one (1) point which may exchange for premium items through accessing “Rustan’s Beauty Source” website. Rewards available for redemption will vary per quarter and by supply restrictions. Items to be featured are cosmetics, fragrances, toiletries, spa, and Beauty Addict merchandise.